Airwoman by Zara Quentin. Zara Quentin, 2016. Paperback. 316 pages. Airwoman is easily one of the more unique fantasy novels that I've read this year, and I am excited to share this book with all of you. When I started reading Airwoman, I wasn't exactly sure what to expect. Was it going to be like a 'superhero' story? An action adventure? Or something else entirely? But I was intrigued by the premise and the fact that the people in this book had wings and could fly (not to mention the wonderful cover, as well! ), so I accepted this book to review in order to find out more. and I was very pleasantly surprised by what I ended up reading. First off, this is a great adventure book, and I definitely felt entertained for a majority of the book. The beginning portion felt like it moved slightly slow at times, but it definitely picks up and turns into quite an adventurous journey. The pacing seems consistent throughout, though it can seem as if it is a bit on the slow side at times — but this never lasts for long. I thought Jade was a really well-written character, and I found that she was able to explore herself throughout the course of this novel. She is initially a rather obedient, meek girl. I could see hints of her more confident, potentially rebellious side, but for the most part she didn't really act out in any way. But as the story progressed, more aspects of Jade's personality begin to emerge, and I was excited to discover a stronger, more confident side of her. Her father's death is tragic and shocking, and I felt that Jade's reaction to his death and her subsequent actions fit really well with the events that took place. When Jade begins her training with the Traveller Force, I was hoping that there would be more detail about the training practices and their purposes, but unfortunately this section was a bit short (you'll find out why), and it never went into much detail. I found the reactions of those in her training section to be understandable, but also slightly over-dramatic, and I was frustrated to find Jade being singled out for reasons that are hard to justify. I really loved the world that Quentin created this book, and I wish I knew more about it! While the author provided plenty of insight into how the Dragonverse world worked, I would have appreciated a bit more explanation in order to understand it in a slightly more detailed manner. While the nuances of the world have intricacies that I had to get used to, Airwoman is not an overly difficult fantasy novel to get into and is extremely readable, so I would recommend this to anyone who enjoys adventure, some fantasy, or an intriguing plot. Before wrapping up this review, I would like to note, however, that I was a bit uncertain when I discovered that this book would feature a 'lesser developed' group of peoples living in a different world that Jade's, but I feel that Quentin handled this topic in a deft manner that allowed it to flow smoothly. Quentin's writing style is easy to follow, but this does not in any way mean she is lacking in talent or execution. Descriptions are all done in a manner that is informative, but not overly wordy, and the settings are all described in a manner that really allowed me to imagine the worlds created by the author. Overall, I am giving Airwoman four stars! 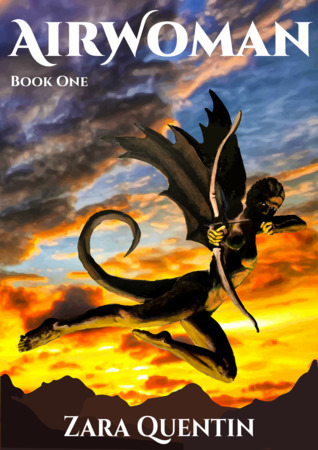 If you want to find out more about the author and what is was like for her to write winged characters, be sure to check her featured guest post!